It's easy to criticize drinks like the Greyhound or the Screwdriver since they really don't require much in the way of mixing—add a measure of vodka to some larger measure of juice and serve it over ice. For those unfamiliar with these drinks, a Screwdriver is made using vodka and orange juice, and its partner, the Greyhound is the same drink only with grapefruit. Even the most inflexible mixology snob has to admit that these are basic highball cocktails—spirit and mixer served over ice, usually in a tall glass. There's no bitters to worry about, proportions are somewhat flexible, and you won't need to balance any sweet or sour. You could even build these over ice, right in the glass, so you probably don't need a shaker. Is it a complicated process? Obviously not. Will these drinks challenge your senses with deep, intriguing complexity? Hell no. So why might you be interested in such misadventures? For one thing, these are popular drinks. They don't require knowledge of a back bar full of obscure ingredients and they feature a familiar spirit delivery method—fruit juice—which also makes them acceptable reviver cocktails in the morning. They are definitely refreshing during the the dog days of summer which helps to guide our exploration on this occasion. Dog days usually refers to any string of sultry days in the northern hemisphere that typically occur during the months of July and August. With that verbal wink, let's take a closer look at the canine variety of these drinks starting with the Greyhound. We must admit that grapefruit was never our favorite. As citrus goes, it doesn't share the the same popularity in cocktail culture as the lemon or the lime, but it does have seemingly hidden virtues. It can be tart, bitter and astringent, but it is normally semi-sweet. Red grapefruit is typically sweeter than lighter varieties. It's the bitterness that turned us away many years ago but we are enjoying renewed interest. It turns out that all of that intensity that used to challenge our taste buds works alchemical wonders in a mixed drink. For proof, try a Hemingway Daiquiri, the Cinquecento, or Edgewood cocktails. In fact, many tiki recipes would be lost without grapefruit. Of course, these have other ingredients to help. So, is the Greyhound just too simple to improve? On the contrary. It may be just vodka and grapefruit juice, but if you make it with gin it's leaps and bounds better! Now we are getting somewhere. So, we have a new furry friend, and it's just as easy to make. Yet, we can improve this even more. Salt has been shown to reduce the perception of bitter flavors, so if we add a salted rim. 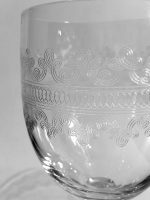 . .
Rim a highball glass with salt and pack the glass with ice. Add gin and grapefruit juice. Garnish with a cherry. Without salt, this drink starts as a Greyhound. Salt reduces the perception of bitterness from the grapefruit. With just a little innovation, these simple drinks take on new and exciting personalities. We could write about one puppy step after another but let's leave some of the exploration up to you and your imagination while we skip ahead to a wonderful and unusual variation from the Ruby cocktail bar in Copenhagen called the 866. Stir vigorously with ice and strain into a salt-rimmed rocks glass over ice. Garnish with a sprig of dill (we used fennel greens). There's a little spirit-swapping trickery happening here. Did you see it? Aquavit is used in place of the gin (or vodka if you are having trouble keeping up). 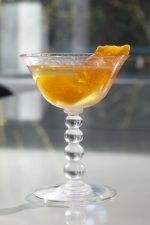 It gives the drink a caraway and anise flavor which explains the garnish. 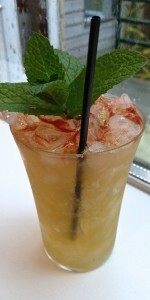 Then, instead of making it into a highball, the volume is reduced and some of the grapefruit is replaced with Campari. This adds even more bitterness to the equation but we are used to that by now. The salted rim helps keep the bitter under control, and now we really have have something! There is additional sweetness and fruity depth from the Campari and the overall effect is just unusual enough to make this an interesting sipper without losing the refreshing aspects on a hot day. We noticed that the flavor improved and unified as we sipped, so adequate dilution when stirring or shaking is a good thing. We first spotted the 866 in the Washington Post where they say the name is a reference to a Danish long-distance bus called the Graahundbus. In any case, we can be friends with this dog.